How many times have you seen this annoying screen pop up while working? If you are like me and want this dialog to vanish till you complete your work then this post is for you. This nag screen is there so that you don't forget to reboot as the updates are not applied till you restart the machine, so its basically for your safety. If you never reboot your machine and you might forget to reboot your machine its best you don't try this as you might stop the updates from being applied. But thats enough about why its there now the way to remove it temporarily till you manually reboot your machine. 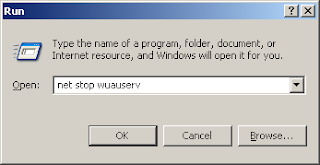 Just type this in your run dialog "net stop wuauserv". You can press "Window Key" + "R" to open the run dialog. Once you run this command it will stop the windows update service for that session i.e. till you don't reboot your computer. UPDATE: I also came across this blog post on zdnet which shows you how you can change the Local Computer Policy to increase the time from the default 10 minutes to a higher value. So instead of being nagged every 10 minutes you will be nagged every "x" minutes that you set. Since I just want it to stop till I manually reboot the system the tip I have posted above works for me.